[XPB-LVQD1] The Verge LVQD Series Trough Sink includes an all-in-one State of the Art built in Washbar that spans from left to right and includes hands free soap, water and hand dryer. 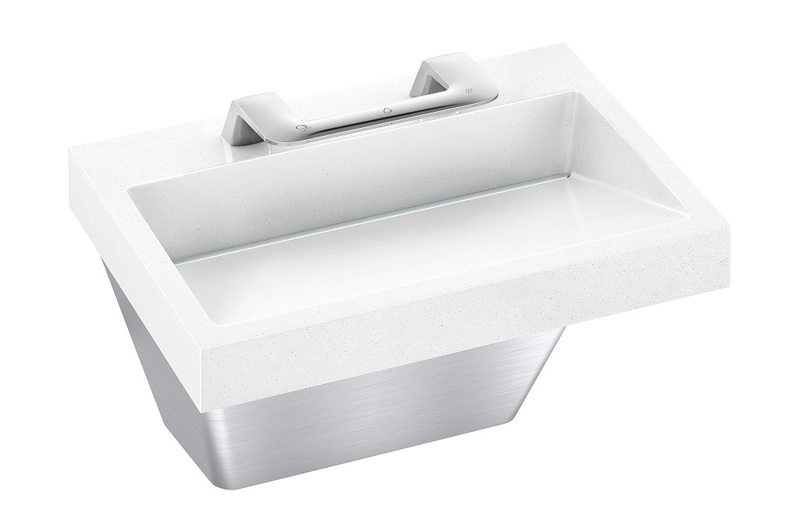 This State of the Art all-in-one sink requires a 110v-120v dedicated outlet for operation.The Verge series is a unique modern quarts bathroom trough sink & lavatory system that is ADA Compliant. It’s available in Evero™ Natural Quartz Material that is GREENGUARD Certified. Evero is durable, long lasting, and non-porous. This makes Evero easy to clean and maintain. The absence of cracks or crevices prevent bacteria and mold from accumulating. Evero is also chemical, stain, impact resistant, scratch resistant, and it’s repairable! This lavatory system serves one to two users at a time. The faucets are sold separately. For shipping quotes, orders or questions please call our Customer Service Center at 1-877-483-9270.